Some days are more challenging than others. Today wasn't easy. I was tired and generally cranky. I left work for a haircut this afternoon--then returned and worked late. More than once, I paused to compose a support text--and more than once I paused for a prayer and some meditations. It's days like today when I'm reminded how fragile this whole thing really is. There was a time when a day like today would be the perfect excuse to binge my face off. But, honestly, it never helped--I mean, let's be real. It never helped. I must remember that on a regular basis. Mom is in the hospital tonight. Her gallbladder situation has quickly become much worse. She's having surgery in the morning. I'll be going to the hospital to be with her not long after my morning show. I would be there sooner, but we're short staffed at the studio. A colleague of mine was seriously injured in an accident at her home. She's recovering and we're all hoping she returns soon. Until then, there's not a backup. I exchanged some messages with my cousin tonight. I truly miss that guy. We grew up together. He lives in Minnesota. We don't see each other very often and we don't talk nearly enough, but when we do, it's always a good thing. He just returned from a week stay at Mayo Clinic. His medical situation is serious. His spirits, perspective, and attitude are all amazing. I admire that about him. He's always been strong, to me. When I think about my mom, my seriously injured coworker, my cousin's medical situation and everything else, including Kathleen's personal epiphany filled post, it reminds me that I better get my gratitude list together. It's okay for me to have a tired and cranky day. We all do, occasionally, right? At the same time, I think it's important to keep it in perspective and shift the focus away from grouchy--and straight to gratitude and service. I have a lot to be grateful for. Today I maintained the integrity of my maintenance calorie budget. I remained abstinent from refined sugar. I met my daily water goal. And I stayed connected with good support. Today: I maintained the integrity of my maintenance calorie budget. I remained abstinent from refined sugar. I exceeded my daily water goal. I stayed in contact with good support connections. And I had a great workout tonight. It's been a very long day. I'm opting for an "almost" Tweets Only, tonight. It's the smartest move for me at the moment. I'm super tired. Anonymous writes: "You always make it look easy." It might look that way on the surface, but let's go a little deeper with the help of an excerpt from the archives with a few minor edits for this republish. I'm not the strongest person and I don't have amazing willpower. It's assumed that these things are necessities along this road. They're not. When I end each blog post with the word, "strength," it's not necessarily strength to stick to your plan. It's about installing strength within your plan. It's about having the strength to open your mind to new perspectives and concepts. It's the strength to care enough to make what you're doing for you, important. But you don't have to be strong or have the best willpower. It's a common misconception. If I relied on my own strength and willpower, I'd still be over 500 pounds right now. Or dead. I recently shared my 80/20 philosophy concerning a ratio of focus between the mental/emotional and the food and exercise elements. Through my experiences, I contend the stronger focus remain squarely on the mental/emotional elements, allowing the food and exercise plenty of room to grow and develop naturally. When I examine weight loss attempts in my past, I can clearly see how my focus was mainly on the food and exercise, accompanied by a constant reminding of how strong I needed to be and how much willpower I needed to exert in order for it to work. Those attempts didn't work. Even though I had the good foods, I was walking a lot and I was doing my best to be strong and exhibit a super-human willpower...nothing stuck. I didn't maintain a shred of consistency during those times. And soon, like all the other attempts, my resolve would fade into the fog of food chaos and rapid weight gain. If you were to ask me what happened, I would have likely said something along the lines of-- "I guess I wasn't strong enough and just didn't have enough willpower." And most people would empathize with something like, "well, weight loss is really hard--hang in there, you can do it." If maintaining balance and control is hard, then doesn't it make sense to hold onto something for support? Like a rail of some sort? Or a series of rails, strategically placed along the way--providing balance and support? That's the key. It ISN'T building the perfect food and exercise plan from Day 1 and white-knuckling it all the way while praying for strength and willpower. It's about developing rails of support. Some people need fewer rails, some more. I say the more the merrier. I have installed quite a few "rails" to guide me along the way. My rails include logging and tracking my food and exercise. My rails include my personal meditation/prayer time. My rails include staying connected in support daily. My rails include my accountability tweets. My rails include writing/reflection nightly. My rails include making sure I have what I need to succeed; food, exercise--groceries...I must make sure I have what I need, at work and at home. Having what I need, where I need and when I need it, makes things less anxious. My rails include planning ahead--some days require more thought and more detailed planning than other days. My rails encourage awareness and self-honesty as I navigate each day within the plan that has gradually become suited especially for me. What do you think would happen if I suddenly eliminated some or all of these rails from my life, in other words, "went off the rails?" I've lived that scenario. 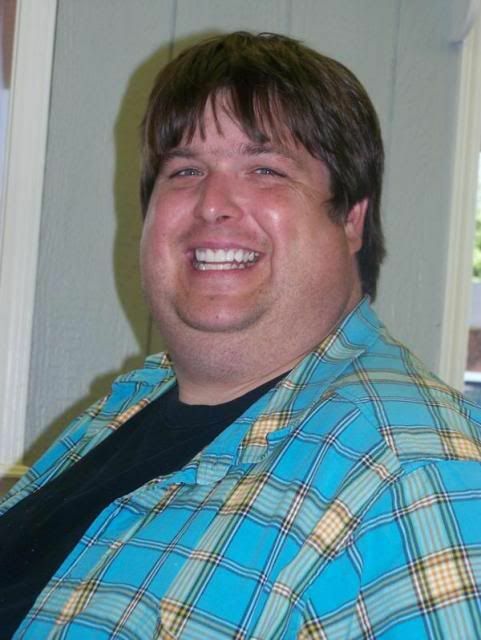 I regained 164 pounds of my initial 275-pound weight loss. I'm lucky it didn't end tragically, that time. Or any of the other times. This trek we're on together doesn't require us to be super-human strong or have the most will power. It's truly not about that stuff. If we want more stability, balance and consistency, we must install rails. Hold on tight to your rails. Let them support and guide you. Today: I maintained the integrity of my maintenance calorie budget. I remained abstinent from refined sugar. I exceeded my daily water goal and I stayed connected with good support contacts. I hope to do it again tomorrow. It isn't easy. It takes effort. But it's worth the effort. Every bit of it. And just to be clear: I don't know it all and I never will. I humble myself each morning, asking for help toward making it one more day. And I hold on. I've been looking forward to today for a couple weeks. Taking Noah to Jurassic Quest could have gone a couple different ways. The backup plan, in case he immediately ran away in terror, was the zoo. He didn't run away! He was fascinated and full of excited energy! He's going to remember this day for a long time. So will I. As I chased him around the exposition hall, the thought occurred, with my continued care each day, he'll possibly never know me as a morbidly obese man. This thought popped in my head as I was trying to remember my first memory, and thinking about how Noah will remember this day. I kept up with him. And that would have been impossible at over 500 pounds. 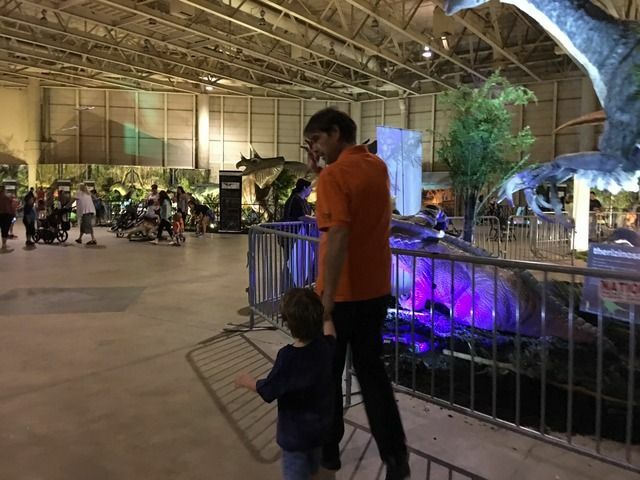 Noah had an absolute blast at Jurassic Quest! I was worried he might be scared. Nope, not at all! I'm so glad. This is something very sweet. Taking extraordinary care of me enables me to keep up with him in ways I couldn't at my heaviest. Today: I maintained the integrity of my calorie budget. I remained abstinent from refined sugar, I stayed in contact with good support via text and I enjoyed a great workout tonight. I'll let the Tweets share the rest! It's a really good thing I'm not a perfectionist. Because today wasn't perfect! I maintained the integrity of my calorie budget, I remained abstinent from refined sugar, I exceeded my water goal and I maintained good solid support contact via text exchanges. I did not get to the gym for my workout. An important part of my plan depends on the benefits of consistent exercise--not just the physical benefits, the mental/emotional benefits, too. It's important for me to NOT make missing workouts a habit. It's also important for me to NOT beat myself up over an occasional day where I didn't. I just got home from Stillwater. Mom isn't feeling well. It's not like her to decline an invitation for dinner and conversation, but she did. 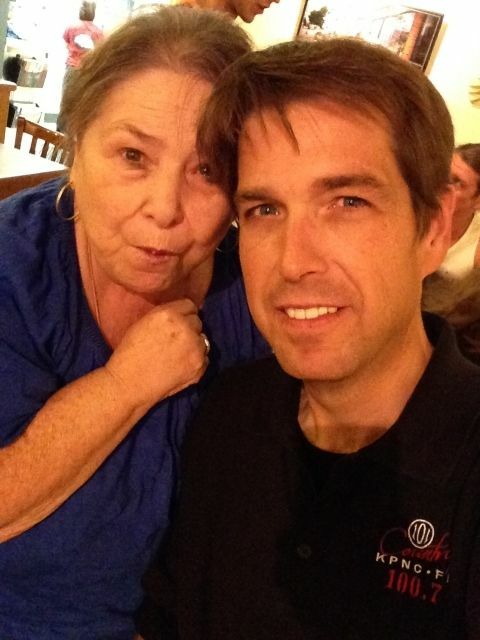 Instead of dining with mom, I had dinner with a longtime friend who was celebrating a birthday, today! I picked up a few things for mom at the store and headed over to visit with her before heading home. She's going to be okay; she already has doctors on this recently developed gallbladder issue. It's affecting her in a variety of ways. I didn't pick the restaurant this evening and it was fine. Although, my appetizer was loaded (see Tweet below). The crab stuffed mushrooms topped with parmesan was refined sugar-free, so I made it fit into the budget--which wasn't hard considering I was at low budget levels by the time dinner rolled around. I'll be up early tomorrow. My first guest podcast interview is at 9am. 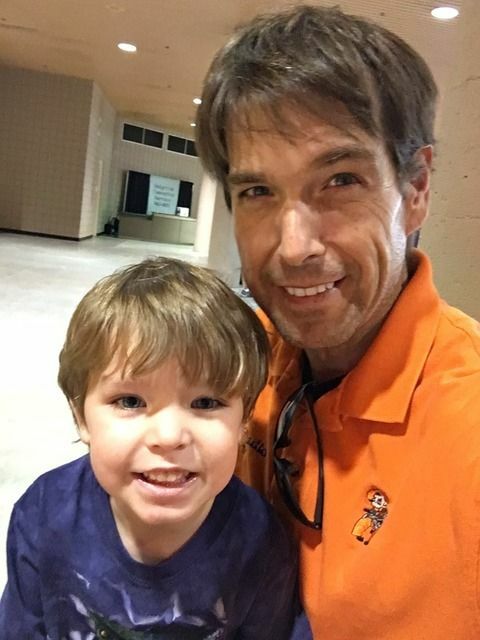 Right after the interview, I'm taking my three-year-old grandson Noah to Jurassic Quest in Wichita, about an hour away. He's going to lose his mind! He loves dinosaurs. But until now, he's only played with his small dinosaur figures. 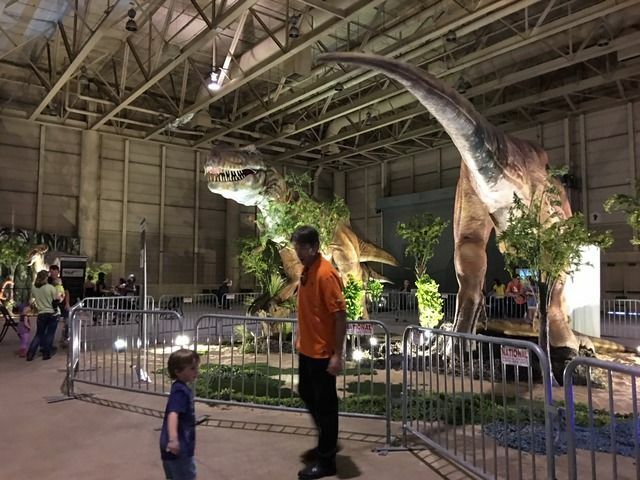 The dinosaurs at Jurassic Quest are life-size animatronic versions! I hope he's not scared. I remember the look of panic from him when I tried to take him to the circus--but that was a year ago. I have a feeling he'll do fine tomorrow! I'll have him back home with his momma by 4pm or so, then I'll be ready for a Sunday evening workout, dinner and some podcast work. My podcast debuts soon. I'm faunching at the bit to show you the cover art--but I must wait until everything's in place--and that'll be very VERY soon. Today: I maintained the integrity of my maintenance calorie budget. I remained abstinent from refined sugar, I stayed connected with good support and I met my daily water goal. I also worked on my podcast tonight! I'm so excited about this new podcast. There's quite a bit of prep work into getting everything set up. But once it's set, it'll be much easier. It's been an incredibly busy Friday all the way around. I made sure to grab a nap this afternoon, in order for me to be able to work tonight. And I'm off tomorrow--and that's a great thing. It'll be the only Saturday I have off for at least the next three weeks. I'll be sleeping in well, in not long. I really felt a nice groove today. I took exceptional care with my food and exercise and had an accomplished day at the studio. I took care of my daily disciplines and I feel a sense of stability as a result. This is a nice example of a solid maintenance day. I'm up keeping an eye on the weather again tonight. I must wrap this short. Today: I maintained the integrity of my maintenance calorie budget. I remained abstinent from refined sugar. I exceeded my daily water goal. I stayed connected with good support and I took a nap in preparation for what I'm doing as I write this post! A big announcement is coming soon about my upcoming podcast! I'm super excited to finally be on the brink of making this project happen!! 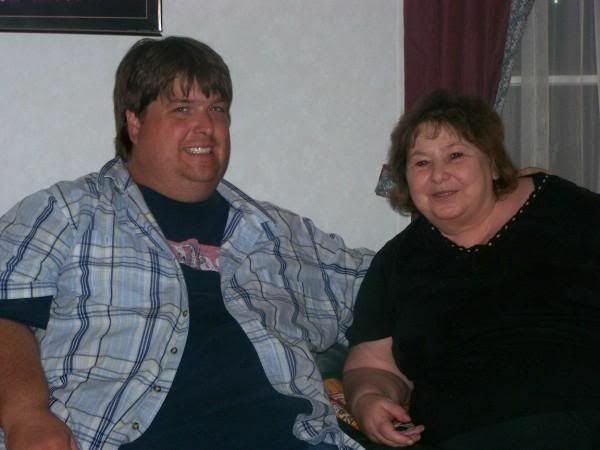 With mom, circa 2007 We've both lost weight since this one! 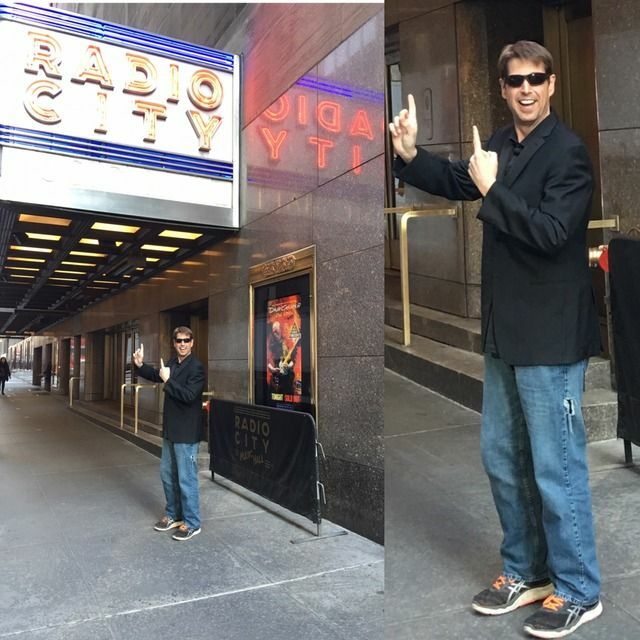 Wearing my "dogbite" jeans at Radio City! I miss New York! Hope to go back someday, soon! It was her first day on the job, a new colleague at the studio--and her first time to sit down with some of us around the conference table at lunch. "You take pictures of your food?" before I could reply, another colleague offered, "He takes pictures of everything he consumes and has for a very long time." Another joked, "he's obsessive about it." My long-time studio mates might tease me occasionally, but they also express a lot of support. They're proud of me and it shows. They remember my 500 pound days very well--including specific moments, like the time I retrieved a piece of pie from the trash can. Yes, I ate it. No, I'll never live it down! Normally, in a situation like this, I'd launch into a big explanation of why I do what I do, complete with the quick version of the 500-pound back-story and why I make accountability and support a super high priority every single day. Instead, I didn't. I just smiled and offered, very simply, "It's an accountability measure for my food plan." And that was that. If you're a regular reader of this blog--you know why I do what I do! Today was another day like yesterday. I had a plan--and something occurred, requiring me to modify my plan. That something was tonight's on-air severe weather coverage. It happens. It's part of my job. I maintained all stated goals of the day except being in bed by 10pm. I finished dinner early in preparation--at least this prevented a super late dinner. Today: I maintained the integrity of my maintenance calorie budget. I remained abstinent from refined sugar. I met my daily water goal. And I enjoyed staying connected with exceptional support. Irene (known as NaNa to our little Noah) and Allan, brought my grandson Noah by the studio this afternoon. He loved putting the headphones on and speaking into the microphone. He might be a natural! Thanks to my job, I have tickets for Jurassic Quest this weekend in Wichita and I can't wait to take him! He's going to absolutely flip!! It'll be like his toy dinosaurs have come to life! I had a solid set of goals today. I really did. And I accomplished a lot, just not in the order I needed. And honestly, it's okay. I'm making tremendous strides and truly feeling extraordinarily well with my progress. I said it/wrote it many times during weight loss mode: "Maintenance will look very similar to what I'm doing now." In fact, aside from 600 extra calories in the daily budget, it's identical. I'm proud of this fact. Is what we're doing sustainable long term? Answering that question each day really helped me define and refine my approach along the way. And still, it's always evolving. The me that sits here tonight will certainly have marked changes this time next year. The key, I believe, for me--is making sure I always keep the plan in alignment with my authentic self--and as long as I do that, it'll be an easy embrace each day. I have a few ideas for changes I'd like to make and who knows what else will come of this constantly evolving transformation? I do know one thing, I pray that I always make the fundamental elements of my recovery just as important tomorrow as I do today. Because for me, it's the fountain of my freedom. I don't resist it, I embrace it. If ever I lose it, it'll be because I released my embrace. And if I ever release this embrace, it'll likely be because I wasn't being true to my authentic self. And that would be tragic. Today: I maintained the integrity of my maintenance calorie budget, I remained abstinent from refined sugar, I exceeded my daily water goal, I interacted with solid support connections and I had a great workout tonight.